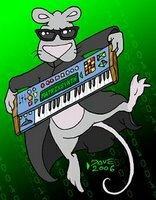 Some synth info at the bottom of this post. MiniKorg 700S and Yamaha Motif in the video. The studio recording features the Oberheim OBX-a, Xpander and Yamaha FS1R. The main brass sounds in the verse is the Oberheim OB-Xa and Yamaha Fs1-R simultaneously. In the chorus the Oberheim Xpander was used for the synthpads with the OB-Xa. And for the Motif: "I didn't really use for the keyboardsounds but the special stand was made especially for the Motif. For live gigs I am using the Motif and the FS1-R. I really like the dark warm Oberheim sounds and I am looking and waiting for the new 4-voice from Tom Oberheim to come out...."